Grooms: Do you have a wedding coming up? Congratulations! Whether you’re getting married this spring or in the fall, now is the time to start thinking about what you’re going to wear. Your fiancé has already found the perfect gown. Now it’s your turn to find the perfect wedding suit or tuxedo. No matter where you shop or what you wear, I want to give you some guidance on how to build an awesome looking outfit. Generally speaking, the level of formality of your wedding ceremony will determine the fabric of your clothes. For instance, a dark suit or tuxedo will look best in more of a ballroom-style wedding held in the evening. On the other hand, an outdoor wedding at a vineyard might dictate more of a grey or earth-toned jacket. Something to bear in mind if you’re buying your suit instead of renting it, is that you’ll be able to wear it again after the ceremony. That can mean date night or for the office. One of the most versatile fabrics is something in dark navy. 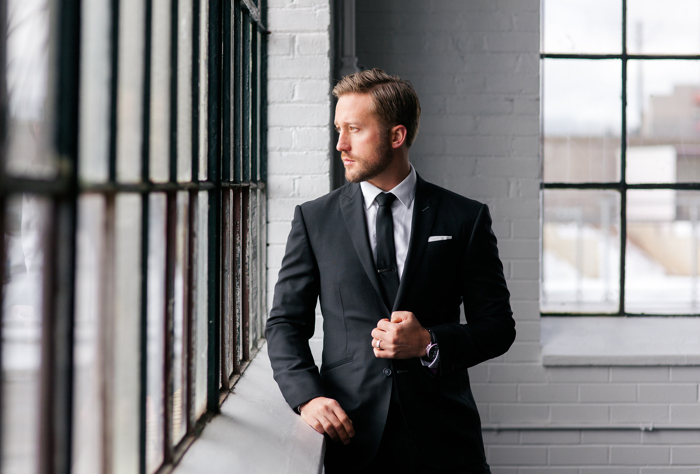 When you are shopping for a suit, you’re typically going to be confronted with two choices when it comes to the lapel: notched or peaked. 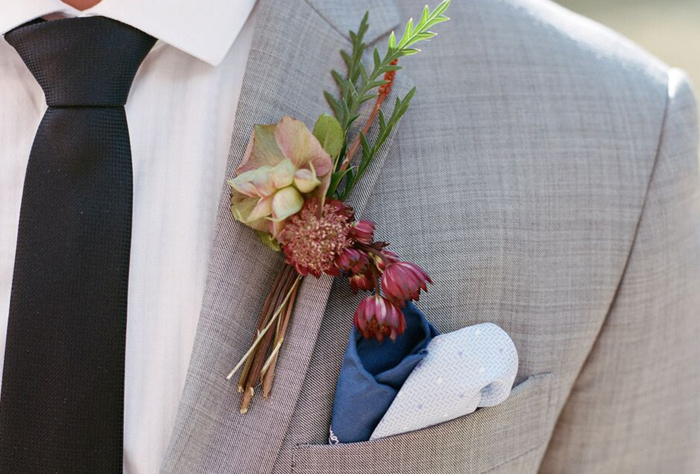 The former is pretty standard and can be worn just about anywhere, but for your wedding, you may want to consider something that’s a little bit bolder than the notched style, and that means a peaked lapel! The jacket lining is all too often an afterthought. And that’s a shame, because choosing a fun lining in your jacket is a great way to show off a little personality. It doesn’t have to be anything too wild, but just something that will serve as a subtle reminder that your outfit is no ordinary suit. After all, it's no ordinary day. First of all, think long and hard about whether or not you want to wear a bow tie. If you're not usually a bow-tie sort of guy, is your wedding really the best time to start? Always go with what makes you feel most comfortable. Also, give yourself some practice tying the knot beforehand. The jacket sleeve length shouldn’t extend past the first knuckle of your thumb. And the sleeves should show just about a quarter inch, or maybe a little more, of shirt sleeve. Make sure that when buttoning the top button of your jacket, the lapel doesn’t “peak” or “tent” outwards under strain. You want it to lay nice and flat. Stand in front of a mirror with your hands at your sides. You should be able to see a little gap between your sleeves and the sides of your jacket. Tailor your shirt so that it isn’t too baggy. Even if you’re a bigger guy, there’s a good chance that your shirt is still too large for you. Also, if you’re wearing French cuffs, practice a few times at home folding the cuff back on itself and putting in the cufflinks. This can be tricky the first couple of times you do it and you don't want to wait until the ceremony to learn! Tailor them such that there is little to no “break” at the cuff. Anything more is not only out of style, but will make you look shorter than you really are. 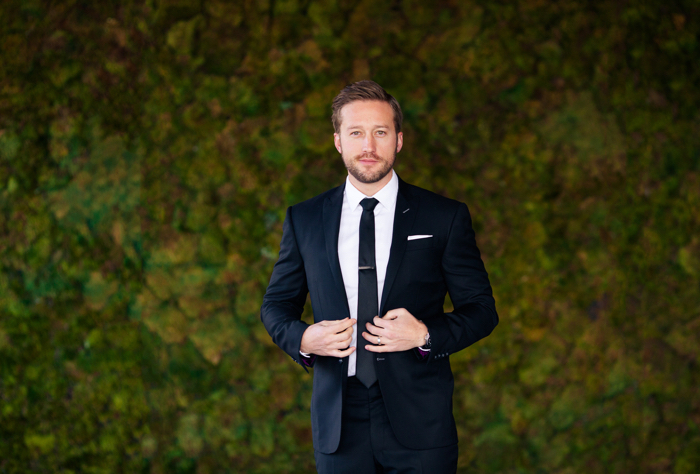 About Ryan: Ryan Wagner is the co-founder of Bespoke Edge, a Colorado-based men’s custom clothing shop. When he isn’t blogging for BE, he’s usually out in the mountains with his mountain bike or fly fishing rod. Photos courtesy of: Ashley Kidder (1st, 3rd & 4th) and Laura Murray Photography (2nd) for Bespoke Edge. Pleasant company, delectable food, good times...getting it right.